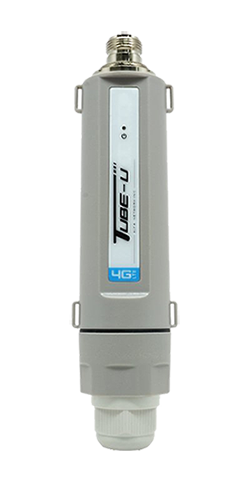 The Tube-U4G from ALFA is an Outdoor LTE dongle and supports up to 100Mbps download and up to 50Mbps upload in the 4G/LTE network. Also backwards compatible with UMTS/EDGE/GPRS and usable with other 4G antennas with N-Male antenna connector. Thanks to IP66 weatherproof. The ALFA Network Tube-U4G is a weatherproof LTE USB adapter for connection to a PC / laptop or the ALFA Network R36. The Tube-U4G in combination with the supplied N-Female LTE antenna offers you excellent reception characteristics so that you can connect to the mobile network anywhere. As the Tube-U4G offers an IP66 outdoor enclosure, you can position the tube outside in a sublime location, such as on a camper/caravan or on the deck of a boat. At the bottom of the Tube-U4G is a mini-USB port and the slot for a standard 6-pin SIM card, both protected by a weatherproof cap with cable entry from environmental influences. Cable ties are included for easy mounting. With these you can attach the Tube-U4G to a mast. This fastening method is simplified by the tabs on the edge of the housing of the tube. If no mast is available, then an ALFA TSM1 adapter or a suction lifter are very good possibilities of fastening. If you use the ALFA Tube-U4G as an LTE USB adapter, you can use it toconnect with one Windows PC or laptop with very good mobile internet. In the LTE network, up to 100 Mbps download and 50 Mbps data rate can be achieved. To use the Tube-U4G as a LTE USB Adapter you only have to connect it to your Windows PC or laptop using the included 5m long USB cable. The driver is installed automatically and you can use the mobile Internet connection immediately.